1) Every political system is effective to the extent that their leaders are representative: the people in the street have shown that today that has ceased to be. In this sense, they are asking us to dialogue after 15 years of oppression. We do not want the peace of slaves: we are free Venezuelans. No dialogue is possible with a crony and totalitarian regime, which seeks to make us dependent. Freedom is not for sale . We will not legitimize a regime that has impoverished the majority of Venezuelans. The dialogue roundtables of 2004, in which Jimmy Carter and Cesar Gaviria were, demonstrated that there are not good intentions. Such regimes are inefficient: they purposely destroy Nations to control them better. 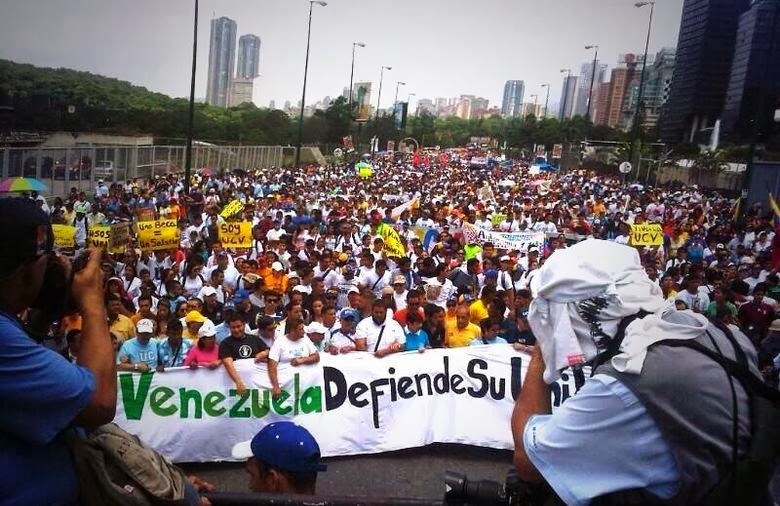 We will not dialogue to perpetuate in power the worse Venezuelans. Any possibility of dialogue for us is imperatively conditioned, for a root change of the system. 2) We demand as patriots the withdrawal of the entire Cuban military occupation force . We want them to leave our territory, all the functionaries in our institutions because they represent, with their interference in our internal affairs, a threat to the security of the Nation . We want a sovereign Nation. 3) We will conquer our freedom. Individual freedom. Economic freedom to be able to live by the product of our own efforts. Freedom of speech to inform and express ourselves without any controls by any regime. Political freedom to protest, assemble and organize without it being a crime. Freedom to choose without it signifying a farce. We do not tolerate the controls of this Castro-communist regime nor any other that undermines the values ​​and principles of Venezuelans. 4) We demand the disbanding and disarmament of the paramilitary groups that protect and arm the regime to instill fear among Venezuelans. In this sense, as long as the terrorist attack by these groups continue with impunity, we call on the people to defend itself. We protect ourselves with the "Trenches of Freedom" in our cities and towns, because we will not allow attacks on what is most sacred to us: the family and heritage. 5) We demand the immediate release of all political prisoners , full freedom for those who were detained and the return of all exiles. This is the moment to define our destiny. Our national identity is being tested and we have sensitized the world to our courage. There is no possibility of real change if we do not arrive to the end: therefore, it is prohibited to lose. We will win, and with the people reestablish the nation as the freest on the continent. In memory of our fallen we will not give up. It's time to rewrite the history of Venezuela and sign it with the sweat of our efforts. Zulia: Yorman Barilla, Eduardo Fernandez, Juan Urdaneta, Victor Ruz, Luis Diaz.